Kansas City Kansas – Page 3827 – Welcome to Wyandotte Daily! A gas line was struck near 2300 Metropolitan Ave. today in Kansas City, Kan. According to a Kansas City, Kan., Fire Department spokesman, residents were evacuated from a nearby apartment complex, and about 600 students at Argentine Middle School were evacuated to Harmon High School. Most residents of the apartments left in their personal vehicles, while a Kansas City, Kan., transit bus helped residents without transportation leave the area, the spokesman said. The gas leak was fixed by Kansas Gas Service and residents were allowed to return home at 2:15 p.m., according to the Fire Department spokesman. Students from Argentine Middle were returned to their school by the end of the school day. No injuries were reported, the spokesman said. There was a ribbon-cutting at Donnelly College Oct. 1 in Kansas City, Kan., in honor of a new program called Jobs for America’s Graduates. 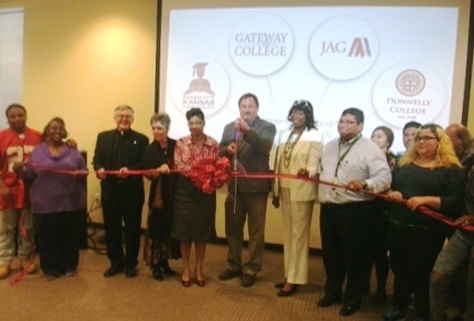 Donnelly College is a partner with JAG, Gateway to College and the Kansas City, Kan., Public Schools to help Wyandotte County students to be ready for college. The organizations will help students obtain high school diplomas and college degrees, and will help with their career opportunities. This program is the first one in the state of Kansas, according to Donnelly officials. There are 43 programs like this nationwide. The student-to-teacher ratio at Donnelly College is very low. This program encourages students to learn, both in and out of the classroom, in a positive manner. Donnelly College is known for its individual instruction, said Monsignor Stuart Swetland, president of Donnelly College. According to Bill Hurrelbrink, communication coordinator with Mayor Mark Holland’s office, this is part of the healthy communities program. This program not only teaches students to learn in the classroom, but it also teaches them how to deal with life. Burglary, criminal damage, 800 block of North 34th, Hillcrest Village, golf cart, vacuum, door, $2,650 value. Burglary, 2700 block of North 31st, television, currency, $900 value. Theft, 1800 block of Village West Parkway, store, five to seven purses, $1,500 value. Attempted theft, criminal damage, 1500 block of North 13th, vehicle burned, $2,000 value. Criminal damage, burglary, 700 block of North 55th, window, $250 value. Theft, criminal damage, 1500 block of North 13th, Acura, lock, $12,015 value. Theft, 1500 block of North 13th, Chevy 1500, $2,000 value. Theft, 1500 block of North 13th, Ford Explorer, $5,000 value. Burglary, 1700 block of South 35th, laptop computer, $500 value. Burglary, criminal damage, 6100 block of Farrow, window, video game system, video games, $740 value. Burglary, criminal damage, 600 block of Oakland Avenue, screen windows, $50 value. Theft, 8500 block of Cernech Road, AT&T, 200 pair phone cable wire, 225 feet, $5,000 value.